“Footpaths are for walking and must be kept that way. They should not be occupied by vendors or anyone else even temporarily,” remarked a former Commissioner of Police, Bengaluru, on the sidelines of a discussion on safety of women in public spaces, held in 2010. Earlier that year, the police had evicted around 300 stationary hawkers in Shivaji Nagar and Halasuru, mercilessly. This was repeated in January 2012 with vendors in Gandhi Bazar, a busy commercial area in Bengaluru and Neelasandra in June 2014. Similar incidents occurred in Mysore too in 2012. Unsurprisingly, some of these hawkers started living on sidewalks, inside water pipes, bus stands or other public places as they could not pay their house rent. A few among them had been unable to afford reliable accommodation even before eviction. 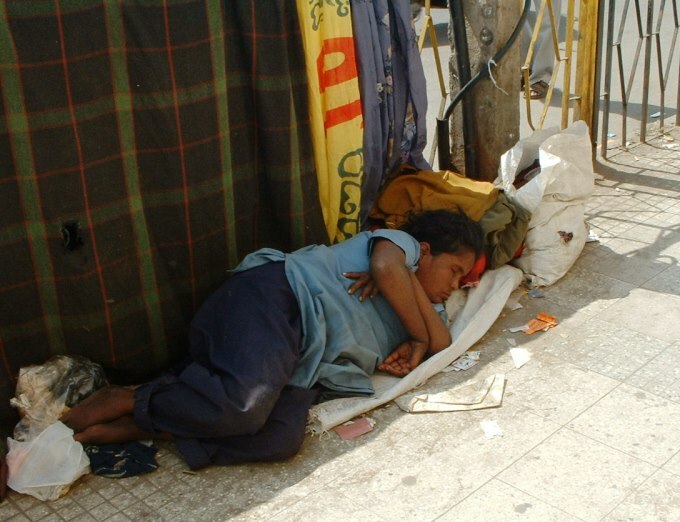 Homelessness is not uncommon among the urban poor. Some who may even be having a place to say elsewhere cannot reside there as it is unfeasible for them to commute daily to a distant workplace. Nevertheless, fighting against all odds of existence, these vendors and other street dwellers continue providing fairly affordable goods and services to others across the socio-economic spectrum and are vital to the survival of urban spaces. Consequently, groups and individuals campaigning for the housing and other rights of homeless persons, such as the Bengaluru-based Indo Global Social Service Society (IGSSS), call them ‘CityMakers,’ a few of whom narrated their tales to India Together. After her alcoholic husband died 26 years ago, Maya’s sister-in-law ousted her and her two-year old son from their house. Having studied till class X, Maya secured a job in a garment factory but she had to give it up owing to an exhausting daily commute, and has since been surviving in public places. Presently, Maya earns about Rs 50 daily and a slightly higher amount on Fridays. Additionally, the building authorities pay her Rs 1000 annually for cleaning the premises. Fluent in Hindi, Tamil and Kannada, Maya exudes warmth and pragmatism. About nine months ago, Maya was allotted a government quarter in Nayandahalli, over 7 kilometres from K. R. Market, costing Rs 14 by the cheapest government bus, one way. She pays a monthly rent of Rs 2000, plus electricity and water expenditure, for the house with a bedroom, living room, kitchen and washroom. However, until now, Maya has not been able to obtain any governmental identification document (voter identity or family ration card). This makes it impossible for her to access social entitlements such as subsidised healthcare and foodgrains. Yet another tale is that of Gowramma, aged around 60. A native of Thiruvannamalai in northern Tamil Nadu, she has been a shop cleaner in the narrow, crowded by-lanes of K R market since the 1970s. Born in Athur village in Tamil Nadu, she received a job card under the MGNREGA scheme during one of her visits to the village, but never got any work, compelling her to come back and continue working in Bengaluru. Gowramma sold her small tin sheet house in Ragigudda in southern Bengaluru around 15 years ago to repay debts incurred upon the treatment of her late alcoholic husband, rendering her homeless and vulnerable to the environment, police and ruffians. From the few thousand rupees earned monthly, her expenses include food and public restroom fees mainly. “I spend about Rs 200 a month visiting my two school-going grandchildren in Thiruvannamalai, the children of my 40-year-old son who deserted his family for another woman. Hence, my daughter-in-law, a daily wage labourer, does not support me. 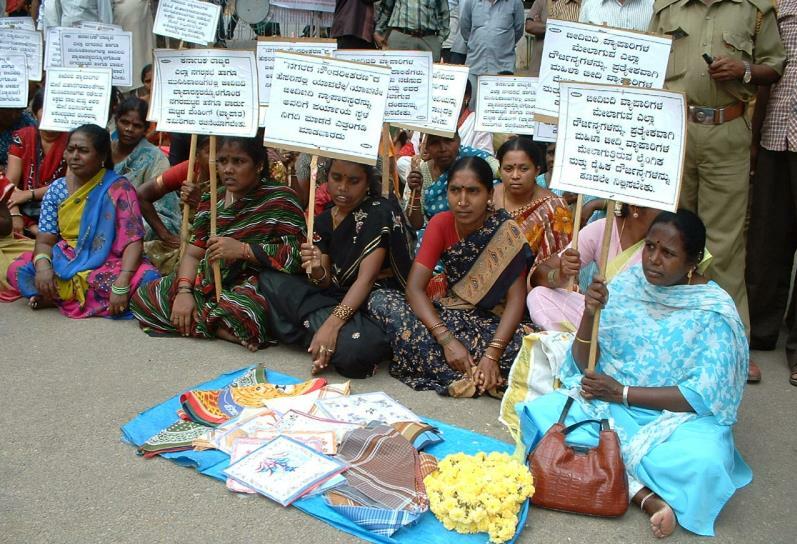 My daughter and son-in-law work in a quarry in Villupuram, in north-coastal Tamil Nadu,” Gowramma revealed. These troubles do not deter this dignified lady from living her life or striking up a friendly conversation, although she does fear that the police could institutionalise her under the Karnataka Beggary Act 1975. Then there is Prabhu, from Thirukoil in Tamil Nadu, whose older brother brought him to KR Market during his school summer vacation, nearly twenty years ago, when he was 12. Out of school, he has been loading and unloading goods and delivering them since then. “Sometimes, I am unpaid for 2-3 months. Yet, I work and live in the busy streets and public spaces here, despite the growing pollution, primarily because I lack skills for other jobs. I spend Rs100 every day for food,” he shares. In addition, he incurs a monthly expenditure of Rs 150 on visits to his parents, wife and two children who live on a small plot of land that he owns in his hometown. An enterprising man, Prabhu has formed a CityMakers’ collective in his locality. This group of around 25 people meets at least once a month to educate themselves about their rights and entitlements. They also conduct public advocacy campaigns highlighting their issues. While the children of many such street vendors study in government schools, in most cases, the parents strive to send them to private institutions despite the cost involved, as these schools are considered to be better. A few families are fortunate enough to find places such as Sharada Sishu Mandir, a government-aided, Kannada medium primary school (run by a non-profit trust) that offers tuition, meals, uniforms, books and stationery, freely to children of homeless adults in Kalasipalaya, Bengaluru. With an anganwadi attached, the institution has committed staff offering academic and extracurricular education to 50 children who mainly survive on the streets and in public spaces with or without their families. Ironically, middle and higher income families who use the affordable goods and services of such vendors, rarely accept the long term presence of vendors or their families in their neighbourhoods. Nor do many of those who bargain for optimum rates understand the lives of the hawkers and their hardships. For instance, hardly any of her customers know that 61-year old Rajathi, a fishmonger, survived on the streets of Kalasipalaya in Bengaluru before she found a tiny rented house in Nayandahalli. Rajathi recounts, “Belonging to Thiruvannamalai, a town in northern Tamil Nadu, I came here decades ago to look for work. Having lost my husband and daughter, I now live with Sivaranjani, my 20-year-old granddaughter who completed her pre-University education and assists me. My son also contributes to raising Sivaranjani. I hope that the government will fulfill its promise of allotting me a permanent house with a title deed and also support me financially”. Rajathi was advised by Hamsa, IGSSS staff to apply for the monthly pension of 500 rupees, a measly sum that economically marginalised elders like her are entitled to. Increasingly, street vendors and others employed in the informal economy are being displaced and further marginalised by the state and society. In January 2013, the homes of around 1512 families living in quarters constructed by the government for the Economically Weaker Section (EWS) in Ejipura, a low income settlement in Bengaluru, were bulldozed mercilessly under the directive of the Bruhat Bengaluru Mahanagara Palike (Bengaluru Municipality or BBMP) despite an order from the High Court of Karnataka barring the demolition. Supervising police personnel detained over 20 women and a few small children who obstructed the machines that were uprooting the lives and livelihoods of nearly 7500 people. Similar incidents have been reported from Golibar in Mumbai, Nonadonga in Kolkata and Yamuna Pushta in Delhi where residents from socio-economically marginalised households were evicted with minimal prior notice. Although these were demolished with the pretext of constructing better accommodation for the financially marginalised, in reality, the land was given to private agencies, just as in the case of Ejipura, the land was given by the BBMP to Maverick Holdings (a real estate developer) under a Public Private Partnership (PPP) for the creation of a commercial complex. Many of the residents in the demolished EWS houses worked in the unorganised sector occupied as street vendors, automobile mechanics, technicians, domestic workers, construction labourers, plumbers, electricians, carpenters, painters et al. However, only a small number of individuals from the middle or higher economic classes, who utilised the goods and services of the evicted, provided them immediate relief. Sabeha recounts how people of all ages including the infirm, ill and disabled were left to face the heat, rain and cold, pollution from vehicles etc, desperately rummaging amidst the rubble of concrete, cement, bricks, rubber and wood to recover their belongings. This led to serious respiratory, eye and skin ailments among the displaced, apart from bleeding wounds and sprains. Children and women such as Sabeha were also at great risk of experiencing physical and sexual abuse which tends tobe the case with all children and women who live and work in public spaces. People across the country who are forced to relocate owing to infrastructure projects such as the building of dams, flyovers, industrial parks also often become homeless for some or an extended period of their lives, facing similar conditions as described by Sabeha. The same is the case with migrant workers. Many of them do not have an address and hence no ration card or any other document of identification for themselves and hence no access to social security. Even where city authorities construct shelters or temporary residences for them, these are not always done with their interests or practical requirements in mind. Moreover, these spaces tend to separate families as they are usually segregated by gender. Sanitation, hygiene, basic facilities and privacy are found to be lacking more often than not. Although the Street Vendors (Protection of Livelihood and Regulation of Street Vending) Act, 2014 and the Constitution of India guarantee that every person has a right to adequate and dignified housing and livelihood of her/his choice, the realities of life seem to be harshly different for those who make the lives of others easier in our cities.